This is Spain’s fourth largest city, following Madrid, Barcelona, and Valencia, and is situated on the Rio Guadalquivir in a fertile plain in southwest Spain, known as Andalusia. High tides of the Mediterranean allow ocean-faring vessels to navigate to the port of Seville, a distance of 87 kilometers (54 miles) inland. For a number of reasons – the heat in summer, the Moorish Middle Eastern influence – so much of southern Spain employs the use of atriums or patios to introvert their homes, and provide cross ventilation throughout their homes. Additionally, as mentioned above, such atriums can create a microclimate, with the use – as here in Spain – of fountains, and plants. It seems Seville has temperatures as high as 48°C (118°F). As almost everywhere we have studied, Romans “visited” and took over in about 205 B.C.E. The town they found was known as Hispalis. Under Caesar it became an important port. Remember that Romans almost invariably took control of land and sea routes, to move both goods and soldiers. The name of the town became Colonia Julia Romula. As the Empire fell apart Vandals took over in the 5th century A.D., making it their capital in 411. Then came the Visigoths in 441, followed by the Moors in 712 who, in various guises, through succeeding invasions from North Africa, remained until 1248 when Ferdinand II of Castile recaptured the city and made it his residence. 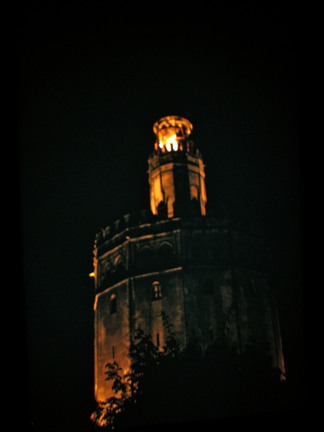 The Torre del Oro (Tower of Gold), so named because it probably was covered with gilded tiles, was built in the early 13th century by the Almohades. These are the people who founded the fifth Moorish dynasty, conquering all of northern Africa as far as Egypt, and also Spain. The construction was used to protect and control the entrance to the harbor of Seville by the use of typical Mediterranean means – that of stretching an iron chain across the water. As in interesting aside, Columbus landed here on his return from his first voyage to the Western Hemisphere, which caused Seville to become Spain’s principal port. Additionally, Seville was granted a monopoly of overseas trade and became the seat of the Tribunal de las Indias. When the Bourbons came to power they favored the Mediterranean city of Cadiz, and the Council of the Two Indies was transferred there in 1720. Some time later, after dredging of accumulated silt, prosperity did return to Seville once again. Something we architects like to call “street furniture,” this rather decorative light fixture not only illuminates, it adds to the senses, as it is also a fountain. It is directly in front of the Cathedral, and we are facing across the plaza. A typical street scene, replete with a park, lines with trees. Actually this gives rise to a most important distinction between a piazza in Italy, and a plaza here in Spain. Sitting in a praca in Nauplio, Greece, and looking at a large tree situated in its midst, one of my students exclaimed: “We never saw a single tree in any of the piazzas in Italy.” This startled me – by its sheer obviousness in retrospect, yet something which had never entered my mind even though I had spent years traveling through Italy. We usually think of foliage, trees in particular, as positive things – they give shade, oxygenate the atmosphere, rustle gently in the breeze. 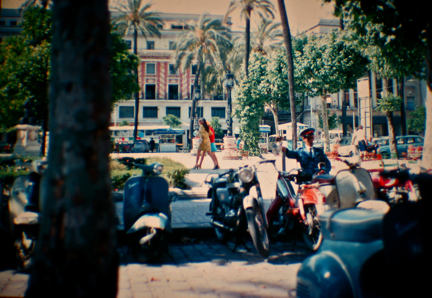 Yet Italian piazzas are - each and every one – charming, comfortable, usually filled with fountains, overflowing restaurants, statuary – but no trees! Research suggestion: find a piazza in Italy with a tree in it. After the expulsion from the country of all who were not of the Catholic faith, Spain sought to catch up on its church building. France, with its Gothic development, was the main inspiration, and some writers refer to the church building in Spain at the time as "French Gothic in Spain." 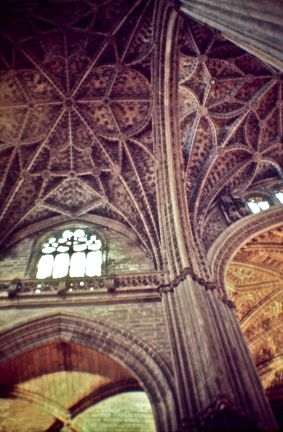 Major construction here was between 1402 and 1526, the late Spanish Gothic period, and produced the largest Medieval Cathedral in Europe, that of the Catedral de Sevilla. Except for St. Peter's Basilica in Rome, this is the second largest church in the world, although some reports on the internet indicate that computer-based figures have put the Cathedral of Seville into the position of being the largest church in the world, as far as cubic space is concerned. At this writing, clarification and verification are in order. The church stands on the site of a mosque, and the base of the mosque’s minaret was retained, becoming known as La Giralda (the Giralda Tower), a much-imitated 16th century belfry addition to the 12th century minaret. During its time of construction, just about one hundred twenty five years, construction followed various styles of the moment, manifesting itself in one example: nine doors enter the Cathedral, and each is of a different design and style. Spain, perhaps as much as Italy, has created wooden doors of exceptional craftsmanship, often with inlaid woods creating patterns and scenes. Though rarely commented upon, this really was a major craft, and deserving of serious observation while traveling through these two countries. Basic statistics and details are as follows: the interior measures 117 meters (340') in length, the body of the church is 76 meters (249') in width, composed of five aisles and side chapels, and the nave rises to a height of 40 meters (131'). The area measures 18,395 square meters (198,000 square feet). Since we have just been to the Cathedral of Milan, a comparison is timely: there, the square footage is 7,806 square meters (84,024 square feet). 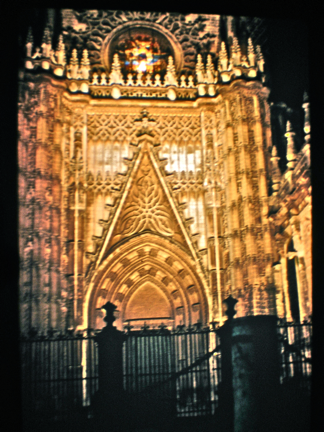 Here in Seville there are seventy-five stained glass windows, dating back to 1504; Cristóbal Alemán created those. Arnao de Flandes designed windows erected between 1525 and 1557. The Spanish painter Bartolomé Murillo designed two altarpieces. The choir has carved stalls dating from 1475, occupying two bays of the nave, and a reja designed in 1519. 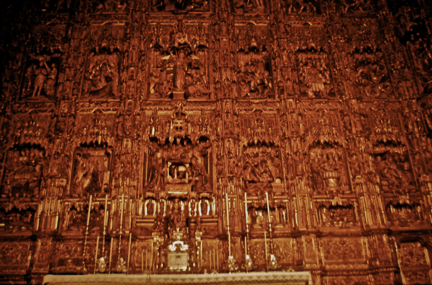 In the Capilla Mayor (major chapel) a magnificent Gothic wood-carved retablo was done in 1550 by Pierre Dancart, and is composed of forty-five scenes from the lives of Christ and the Virgin Mary. Some have called this the largest and richest altarpiece in the world. 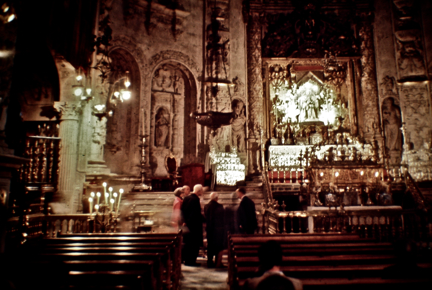 Lastly, the tomb of Christopher Columbus is located here. 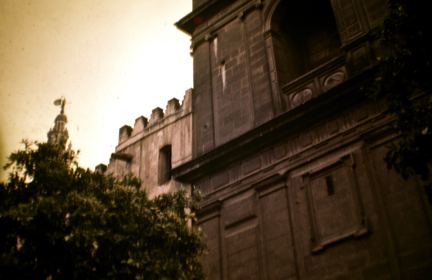 Attached to the north side of the Cathedral is Patio de los Naranjos (Patio of the Orange Trees), which originally was the forecourt of the mosque. As such, it contained a fountain (the midha) for traditional Muslim cleansing prior to entering a mosque. 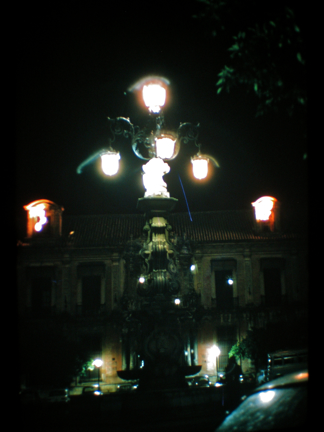 The fountain seemingly dates back to Visigothic times. There is a main entrance on the north side of this courtyard, known as the Pardoner's Door, which was formerly the entrance to the original mosque on the site. This door leads directly into the Patio of the Oranges. From there one enters the north transept of the Cathedral. However, the Cathedral does maintain a traditional western entrance. Architecturally, as mentioned above with regards the Cathedral of Toledo, there is more wall than in France. Here we see some of the heavy walls, surmounted with an open balustrade and a multitude of finials, each reaching for the heavens. The climate is sunnier, especially here in the south, and too many windows of too large a size wouldn't work. It is so hot in southern Spain in mid-summer that riverbeds dry up. Open spaces in the Cathedral have been filled in, often with chapels placed between buttresses. Seville became a major port after the discovery of the Western Hemisphere, and the richness of the city created a multitude of additions to the church, namely a Chapter House and numerous sacristies. The church is roofed with seventy pointed arch vaults, supported by thirty-two rather large columns. 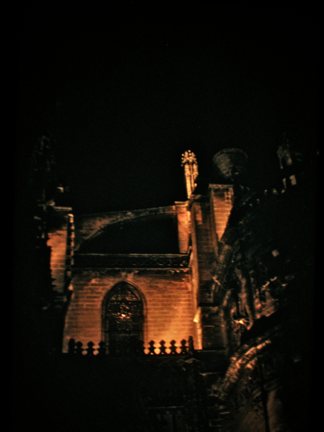 Continuing with our night views, here is one of the flying buttresses. 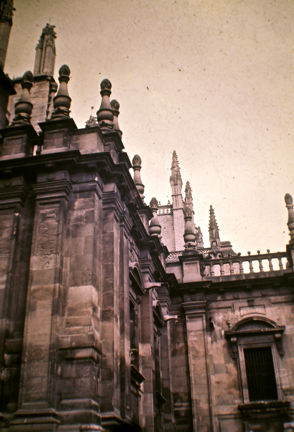 The Cathedral of Seville is a bit foreboding externally, its external supports appearing rather solid, almost mechanical as opposed to the graceful French flying buttresses, for example. Its basic external appearance is, quite frankly, stodgy. Another entrance to the Cathedral. 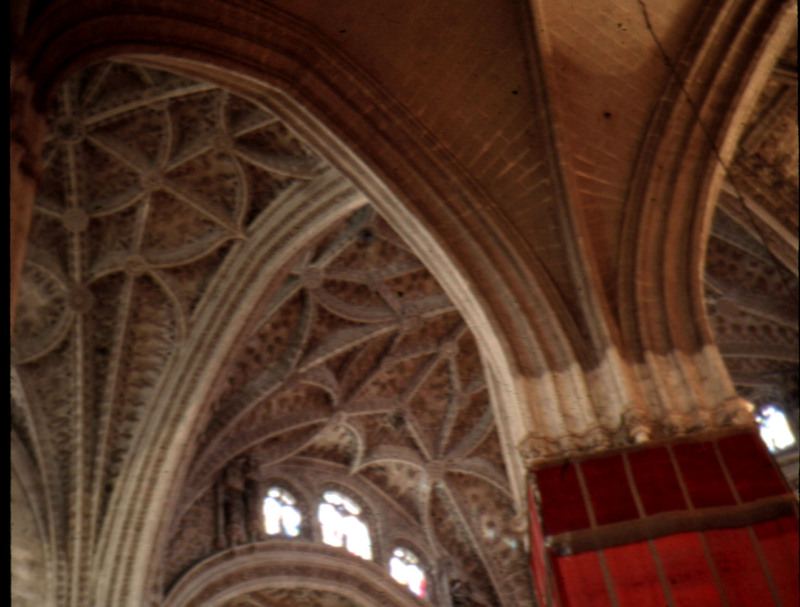 The interior vault over the nave rises 40 meters (130 feet) above the floor. There is no triforium gallery, and the side arcade rises to meet the clerestory windows, which are visible here. 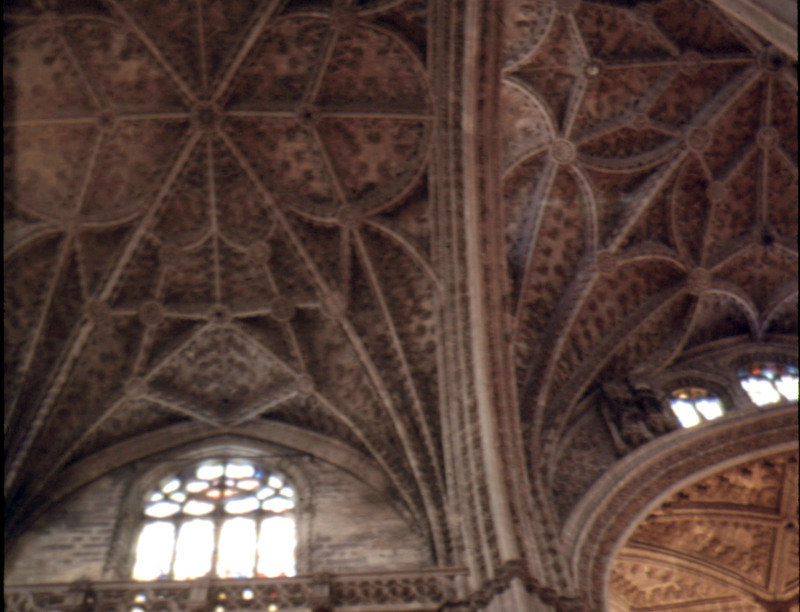 To the extreme upper right is the crossing, designed by Juan Gil de Hontanon between 1524-26. The red velvet covering of the column is for a particular pending festival . 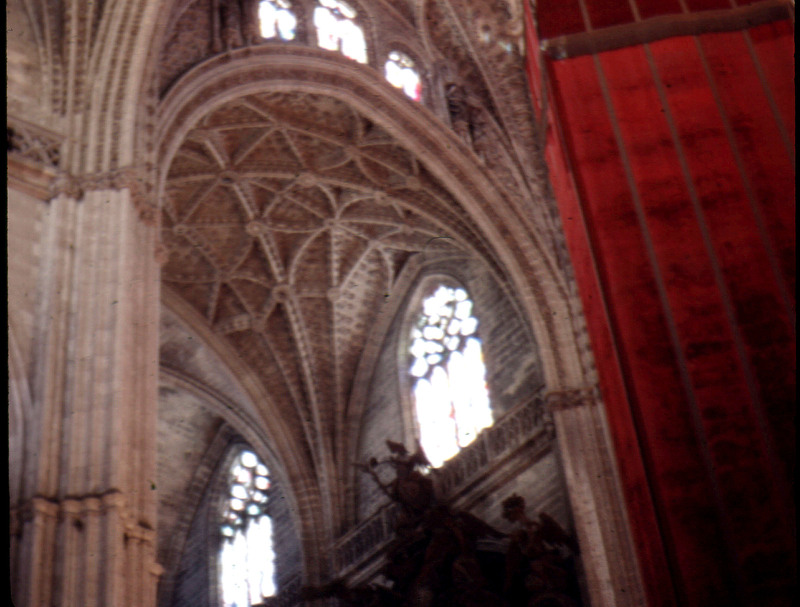 To the extreme right is the crossing, and we are seeing a Spanish version of the French Flamboyant Gothic - the multi-directional ribs fashioned out of a basic quadripartite vault. 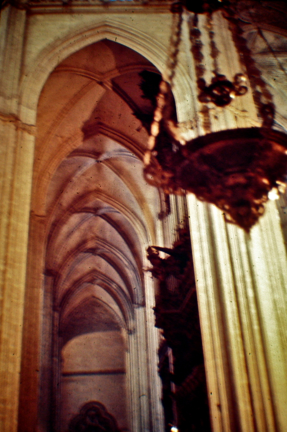 More of the crossing of the Cathedral, behind the velvet-draped column, which is one of four supporting the crossing vault. We see additional clerestory lighting penetrating above the lower nave arch and transept areas. 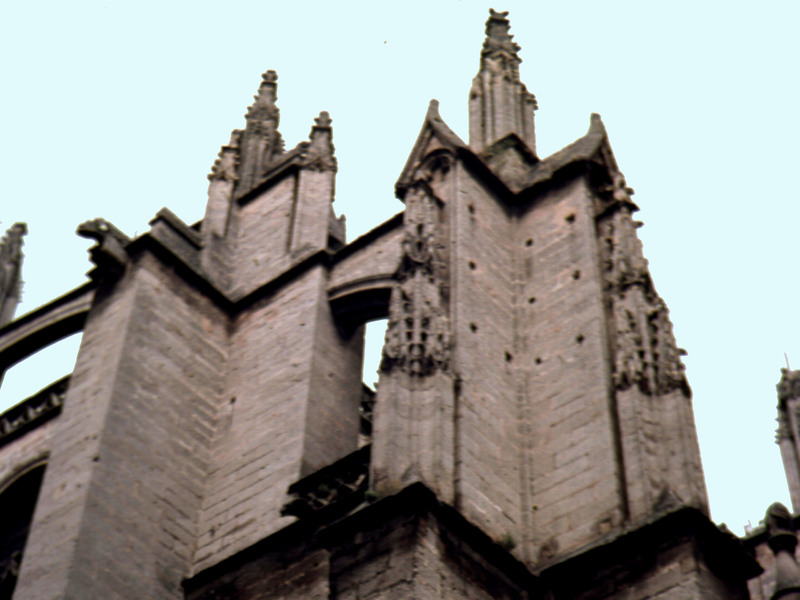 As in the best of Gothic, the piers are composed of articulated ribs, each of which rises into the heights above, and goes somewhere evident. 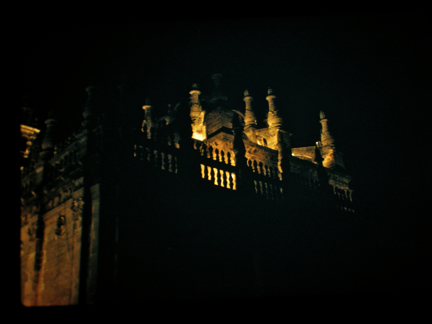 Gothic buildings are among the most expressive structural creations. 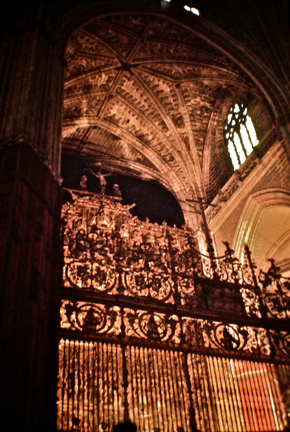 The wrought iron Choir screen, or grille, known in Spain as the "reja," is usually a major art form in its own right. 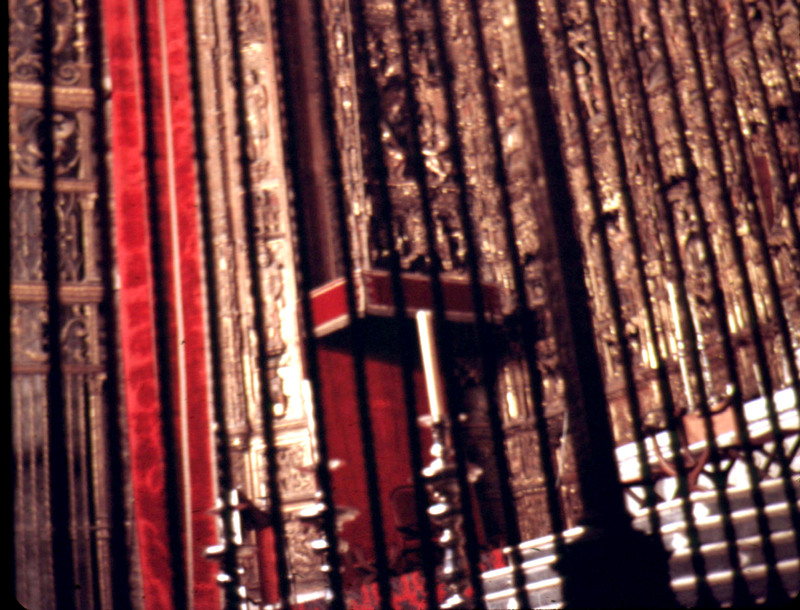 The Choir is thus screened off from the rest of the church, yet the openness of the reja allows sight and sound. A view towards the altar area, at the end of the apse. 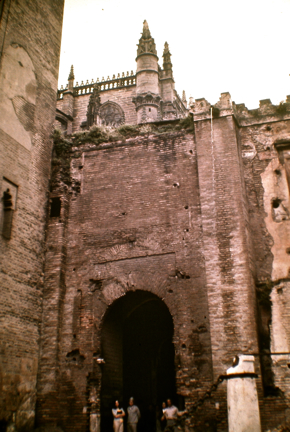 In Seville, the apse is squared-off, not rounded, probably because of the original foundations of the mosque it replaced. This is one of the side aisles. The remarkable wooden retablo, which, as it is oiled, glows as if of gold. It is in the Capilla Mayor, mentioned above. One of the many small altars. Note once more – the reja. 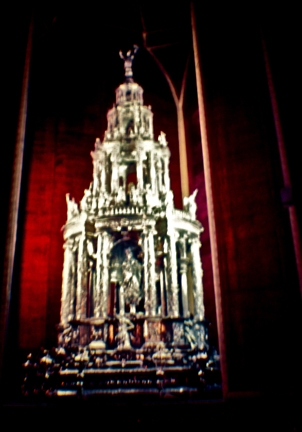 We will end this little odyssey with a picture of the monstrance (custodia), a four level work in silver, begun in 1580. 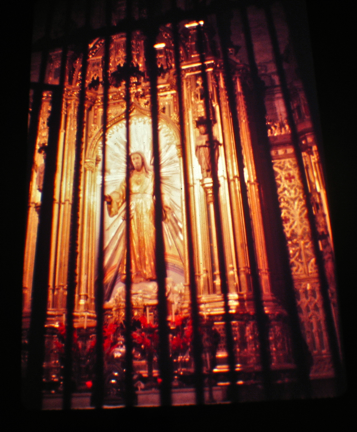 The artist was Juan de Arfe, grandson of Enrique, who designed the larger monstrance in Toldeo. This one is 3.6 meters (12') tall. Each of the levels is supported by twenty four columns, some Ionic, others Corinthian or Composite.